If you’re bored with normal wedding confetti, the type you buy at shops that is mass made for weddings, then what are the alternatives? Even Rice is boring now, unless you jazz it up by dying it in your own colours. It’s really fun to throw confetti so surely there are other things that are more innovative and a bit different? 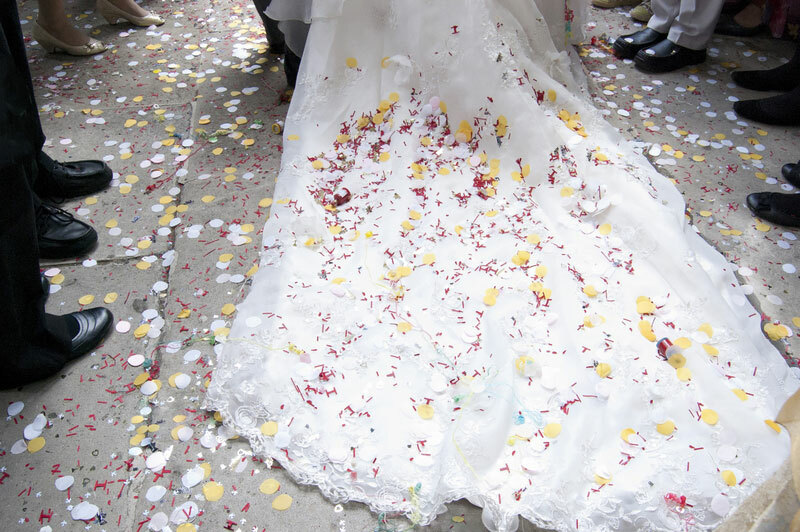 Note: Whatever you decide to use as confetti at your wedding, you will have to check with your chosen wedding venue that they will allow you to use the type of confetti you have chosen (most have a “confetti policy”, i.e. what is and what is not allowed to be used). Many couples opt to skip this tradition altogether. Those that have say its not missed at all as guests cheer and wave to them as they leave the church. Let us know in the comment section below if you know of any other great ideas for unique “confetti” to share with other brides! We’d love to hear what others are doing! We are getting married 26 April 2014. I am looking for live butterfly confetti. If any one can help me where to find them it would be greatly appreciated. We would love to have heart shape confetti made out of foam. We cannot find anybody that can make them and can only let them be laser-cut, but for a A4 piece of foam it works out about R200, which is insane. Can anybody please help us find out about making it. I was wondering wherein Cape Town i can purchase silk rose petals at wholesale prices? I am also looking for little boxes for my invitations and/or table favors. Any suggestions as to where I can purchase some in bulk at a good price? i am looking for heart shaped sparklers? do you have? or where can i get? Mini marshmallows, different colours or sorted. They’re often quite bright. I like the blue and white. Do you know where i can find the mini marshmallows? I am looking for white and blue… if anyone knows please help? This website is very good ,i like ………..
Hi there, I also want to use popcorn… how do you die them? My only worry is that it will stain my dress…. any advise? I am using popcorn as in “cornfetti”. made little boxes for each person for their popcorn and they can decide throw or eat while waiting and having something to drink. Hi Mari, we will be using popcorn aswell, but can you please tell me where you are getting the boxes from,with the printing? How did you make the containers?? do you maybe have a template? Hi, I’ve been looking at a number of websites that mention lavender buds as an alternative for confetti. I went to a wedding expo in Cape Town in the beginning of last year and there was a company there that sold lavender buds and I cant find them anywhere on the Internet. Please help! Hi Carla. you can look for Scatterlings on the internet. It is dried fynbos or lavender buds. It is not so bad.